Octyl gallate is the ester formed by 1-octanol and gallic acid. It can be used as an antioxidant and preservative to be supplemented to the food. It has been demonstrated to be an effective fungicide being capable of inhibiting the growth of S. cerevisiae and Z. bailii as it can inhibit the fluidity of the cell membrane through acting as a nonionic surface-active agent. It is also capable of killing both DNA and RNA viruses with a relatively moderate cytotoxicity. For example, it has the potential to treat influenza. Octyl gallate also has certain bactericidal activity, being capable of treating the infections associated with enterococci. 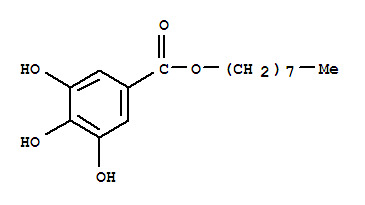 ChEBI: A gallate ester obtained by condensation of the carboxy group of gallic acid with the hydroxy group of octanol. Gutiérrez-Fernández, J, et al. "Antimicrobial activity of binary combinations of natural and synthetic phenolic antioxidants against Enterococcus faecalis. " Journal of Dairy Science 96.8(2013):4912-20.93. Yamasaki, H, et al. "Antiviral effect of octyl gallate against influenza and other RNA viruses. " International Journal of Molecular Medicine 19.4(2007): 685-688. Octyl gallate, a gallate ester (E 311), is an antioxidant added to food and cosmetics to prevent oxidation of unsaturated fatty acids. Cases were sparsely reported in food industry or from lipsticks. Patch tests are frequently irritant.